The Australian Federal Police (AFP) and its partners have destroyed two interlinked crime syndicates operating across Australia, Dubai and the Netherlands, resulting in 17 arrests and the seizure of more than 1.9 tonnes of narcotics destined for Australian streets. 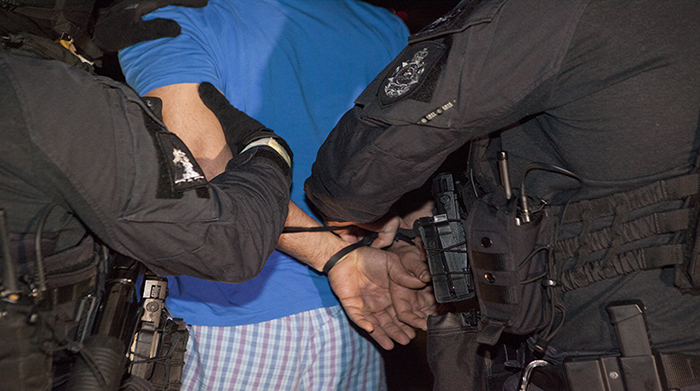 Nine men and a woman were arrested in Sydney early this morning (Tuesday, 8 August), while five men were arrested in the United Arab Emirates by the Dubai police anti-narcotics department in a simultaneous operation. Authorities in The Netherlands followed up this Australian activity with the arrest of two men alleged to have been responsible for arranging the supply of drugs to the Australian-based syndicate. The AFP investigation, with assistance from the NSW Police Force, began in mid-2016, targeting organised crime groups attempting to import large quantities of drugs and tobacco. A total of 1.8 tonnes of MDMA, 136 kilograms of cocaine and 15 kilograms of crystal methamphetamine was seized by authorities in The Netherlands before it could reach Australia. It is estimated if this total volume of drugs reached Australian streets, they would have a potential street value of up to $810 million. It will be alleged in court that the syndicate worked closely to arrange, purchase and facilitate the importation of the drugs across a number of cargo container shipments between November 2016 and August 2017. Following extensive investigations, AFP members, with assistance from NSW Police Force, executed 30 search warrants across Sydney. AFP Assistant Commissioner Neil Gaughan, National Manager Organised Crime and Cyber, said the investigation had been underway for more than 12 months, and the resolution was a result of tenacious and innovative police work by the AFP, and strong domestic and international partnerships. Those involved in successfully resolving this operation include the UAE Ministry of Justice, the Dubai Public Prosecution Office, Dubai Police, the UAE Federal Customs Authority, Dubai Customs, the National Police of The Netherlands, the National Public Prosecution Office of The Netherlands and Hong Kong Customs and Excise. The Commonwealth Director of Public Prosecutions and the Attorney-General’s Department have also provided significant assistance regarding the arrests in Dubai. “A united response from law enforcement and partner agencies in Australia and overseas is critical to our efforts to dismantle organised criminal networks” Assistant Commissioner Gaughan said. “The people we allege are part of this syndicate are Middle Eastern organised crime figures that are well-known to law enforcement, and for decades this group has flaunted their wealth and activities, telling the community they were untouchable. Today, it should be obvious that they are not. NSW Police Force’s State Crime Commander, Assistant Commissioner Mal Lanyon, said police will continue to target anyone who commits crime that impacts on the community. “The safety of the people of NSW is paramount, and along with our law enforcement partners – both here and abroad – we will do everything in our power to ensure that safety is maintained. “In addition to dismantling these criminal syndicates and the seizure of a significant amount of drugs before it even reached the country, investigators have seized firearms, which will also reduce the risk of harm to our community,” Assistant Commissioner Lanyon said. Conspiracy to import a commercial quantity of a border controlled drug contrary to sub-sections 11.5(1) and 307.1(1) of the Criminal Code Act 1995 (Cth). The maximum penalty for this offence is life imprisonment. Dealing in proceeds of crime and money worth $1,000,000 or more, contrary to section 400.3(1) of the Criminal Code Act 1995 (Cth). The maximum penalty for this offence is 25 years imprisonment. Possession of imported tobacco products with the intent to defraud revenue contrary to section 233BABAD(2) of the Customs Act 1901(Cth). The maximum penalty for this offence is 10 years imprisonment. Supply a large commercial quantity of a prohibited drug contrary to section 25(2) of the Drug Misuse and Trafficking Act 1985(NSW). The maximum penalty for this offence is life imprisonment. Take part in the supply of a large commercial quantity of a prohibited drug contrary to section 25(2) of the Drug Misuse and Trafficking Act 1985 (NSW). The maximum penalty for this offence is life imprisonment. A 27-year-old Double Bay woman will be charged with one count of Possess firearm not authorised to do so by licence or permit contrary to section 7A(1) of the Firearms Act 1996 (NSW). The maximum penalty for this offence is five years imprisonment. Those arrested in Dubai by members of the Dubai Police include a 39-year-old Vaucluse man, a 43-year-old Dover Heights man, a 34-year-old Punchbowl man and two Australian men living in Dubai, aged 39 and 30 years old, respectively. The Attorney-General’s Department and the Commonwealth Director of Public Prosecutions will now serve an instrumental part in facilitating extraditions for the suspects overseas, to bring them back to face judicial processes in Australia. Search warrants were executed in the suburbs of Arncliffe, Bankstown, Bellevue Hill, Double Bay, Dover Heights, Enmore, Greystanes, Greenacre, Merrylands, Old Guildford, Parramatta, Punchbowl, South Hurstville, South Wentworthville, Sydney, Wolloomooloo, Rose Bay, Potts Point and Vaucluse.